This electric RC Monster Truck measures over 1 foot long and is amazing! This realistic monster truck features large over-sized tires, shock absorber suspension system that helps it climb over dirt, grass, and obstacles. This is a full function RC Monster Truck that is easy to drive and goes forwards, backwards, left, right, and straight too. Want more? Powered by a high performance brushless motor this RC trucks comes with everything you need. Including a big long run time lithium rechargeable battery, charger, and transmitter. Reach speeds of around 40 mph and is easy to drive for all ages?. Want to play with 2 or more of these RC Monster trucks at one time? Order 2 or more and we will send separate frequencies for the remote controls. 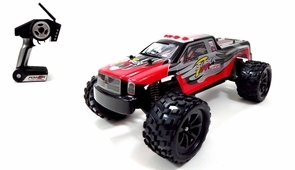 Choose from red or green electric RC monster trucks. Yes, we carry all spare parts just in case and you can also upgrade this truck to make it go even faster! Drive over everything with ease! Comes with super long range interference free remote control with about a 1000 foot range.